Will you see Star Trek Into Darkness in the theater? I have it all figured out. The Butler kills Spock. 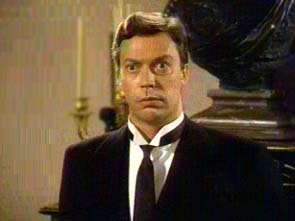 Now that I think about it, it's kind of glaring that Tim Curry was never in Star Trek. Heck, even Malcolm McDowell got in on the act. BTW, the last Trek was packed with meaningful non-famous cameos (James Cawley, that teacher, etc), I haven't heard anything like that about this one. Has anyone else seen this yet? Or do we post somewhere else about this flick? Cause I have a couple questions and comments, chief amongst them being: was that a flying dump truck in the climax? This is the thread to talk about it. Personally, I haven't seen it yet but I've been hearing great things about it and it confirms that what JJ did with the first movie wasn't a fluke after all. This gives me even more confidence that he can actually revive Star Wars from the disastrous Prequels. I totally dug it, even though I had some issues and would have done SOME things differently. But totally worth seeing on the big screen, and seeing as new movies are about to start, Star Trek might not be on the BIGGEST screen much longer. And they shot a lot of this on IMAX apparently, so you definitely want that giant screen. Kind of off topic here, but my local Drive-In Theater suddenly has gotten the rights to show newer released movies. Not sure how this works with what is basically a "Mom and Pop" operation where the money goes directly to the Junior High School (Middle School if you want to be politically correct). So, I'm pretty sure they will be getting Into Darkness soon. There is nothing cooler than having a a Drive-In within walking distance from my house. 5 minutes tops. I’m hearing it’s a great popcorn flick, but has some issues. Maybe that’s some fanboys talking. Gonna go see this again with my sister on Sunday and I'll see what she thinks 'cause she's not a Star Trek fangirl. I'll be interested to see what her reaction is. Maybe fewer "...really? "s, but let's just wait and see. And I don't know if she'd be able to recognize Weller as Robocop.